Sheikh Mohammed Sayed Tantawi, who has died aged 81 of a heart attack while in the Saudi capital, Riyadh, used his position as one of Islam's leading spiritual authorities to champion Islamic moderation worldwide. In 1996, the president of Egypt, Hosni Mubarak, had appointed Tantawi grand imam of the Al-Azhar mosque and head of the Al-Azhar University in Cairo, Sunni Islam's pre-eminent centre of learning, a position he held until his death. He shared platforms with the Prince of Wales and, in 2008, spoke at the Oxford Centre for Islamic Studies on the value of dialogue between civilisations. At the same time, he provoked a fierce backlash from Islamic hardliners, not least for his condemnation of the niqab, or full-face veil, a position he broadcast widely last year during the debate over its prohibition in France. In 2009, he banned women wearing the full veil from entering Al-Azhar's campus. Crucially, he described the 9/11 attacks as "acts of terror directed against innocent people", and went further. Countries harbouring terrorists, he insisted, should be "punished and held in contempt". He told a conference in Kuala Lumpur in 2003: "Extremism is the enemy of Islam." He condemned suicide bombings, telling the press: "If it is against... women, children and old men, then it is not resistance but infidelity." In November 2008, there were calls in Egypt for his resignation after he shook hands with Israel's president, Shimon Peres, at a UN-sponsored interfaith conference in New York. He initially astonished reporters by claiming that he was unaware that it was Peres approaching him with outstretched hand. Subsequently, he accused those who published the pictures of the handshake as being a group of lunatics. He then fanned the controversy by saying that if any Israeli officials wanted to visit Al-Azhar, he would welcome them. The following month a Muslim Brotherhood MP, Hamdi Hassan, complained that "Tantawi acts like a government employee. He wants to please the regime. He does not represent himself, however, but Al-Azhar and Muslims as a whole. Tantawi has a habit of insulting those who disagree with him and he offends Al-Azhar in the process." Tantawi then tried but failed to placate his critics by demanding that Israel end tyrannical practices against the Palestinians. Tantawi had sparked intense debate in the Islamic world early in 2002 when he chaired a conference in Alexandria alongside Jewish rabbis. The conference was attended by the then archbishop of Canterbury, George Carey. He had provoked similar anger when he met Israel Lau, the chief rabbi of Israel, at Al-Azhar in 1997. 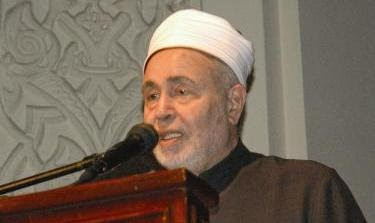 As grand mufti of Egypt from 1986 to 1996, he outraged hardline Muslims by ruling that fixed interest rates on bank deposits are halal(allowed), in the face of a traditional Islamic consensus that all interest rates are haram (forbidden). His critics accused him of acting as a puppet of Mubarak's increasingly oppressive regime. Although Al-Azhar had been founded as a Fatimid seat of learning in 970, and later converted to Sunnism when Saladin expelled the Fatimids in 1171, under President Gamal Abdel Nasser, who was in constant conflict with the hardline Muslim Brotherhood, all Al-Azhar appointments were made by the government and continue to be. Tatwani is likely to be replaced by his deputy, Mohammed Wasel, until the president has appointed a new head. When Prince Charles visited Egypt in March 2006, shortly after the furore involving Danish cartoons of the Prophet Muhammad, Tantawi quoted the prince telling the Oxford Centre for Islamic Studies in 1993: "It is odd in many ways that misunderstandings between Islam and the west should exist. For that which binds our worlds together is so much more powerful than that which divides us." Tantawi told the Kuala Lumpur conference: "I do not subscribe to the idea of a clash of civilisations. People of different beliefs should co-operate and not get into senseless conflicts and animosity." He was born in the village of Selim ash-Sharqiyah in the municipality of Tama, Sohag, before joining a religious institution in Alexandria. After graduating from Al-Azhar's faculty of religious studies in 1958, he went on to teach. In 1966 he was awarded a PhD in Hadith (the sayings of Muhammad, Islam's second source after the Qur'an itself) and Tafsir, exegesis of the Qur'an. By 1980, he was the head of the Tafsirdepartment of the University of Madinah in Saudi Arabia, a position he was to hold until 1984. In 1986, when he had been dean of the faculty of Arab and religious studies for a year, he became grand mufti of Egypt, a position he held for a decade until appointed grand imam. He is survived by two sons and a daughter.